Review: If there's something juicy going on at Middlebrooke Middle School Sofia, knows about it. Sofia's not a teacher, or a member of staff, she's not the most popular girl either, with the most friends, or the coolest stuff. Sofia is your average female, middle school student, and her obsession is blogging, gossip, and trying to ruin Mia St. Claire's reputation. 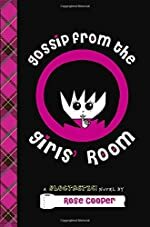 In this story, Gossip From the Girls' Room, by brilliant author, Rose Cooper, Sofia shares the latest, greatest gossip that goes on in her life, and the lives of many other female students. Gossip From the Girls' Room begins with Sofia snooping on two popular girls' gossip while hiding in a stall in the girl's bathroom. The girl's bathroom is the best place to find out the latest, juiciest gossip at her school, and that's exactly what she's doing. She explains Mia's popularity and how AWEFUL she is. Sofia doesn't only talk about girls though, she talks about boys also. Her biggest crush, Andrew, doesn't know she exists. And to make matters worse he has a crush on Sofia's enemy, Mia. Sofia and her best friend Nona, work their hardest to destroy the relationship between Mia and Andrew and get Andrew to like Sofia. Throughout the book Sofia blogs the gossip she hears on her blog titled 'The Best Blog in the World. Ever.' And the blogger (Sofia) is an unknown person going by the name of the "Blogtastic Blogger." At the end of the book Sofia gets a GREAT surprise, makes new friends, and everything seems to be perfect. But it may not last for long! I thought this book was a fun, easy to read book, probably most appropriate for middle school students. But it is easy to read and entertaining for younger children. The story and plot is easy to follow but everything is pretty predictable. The main character, Sofia, is a fun type of person that some people can find they relate to. There are also little drawings or cartoons on almost every page that gave you a visual image, and keep the story funny, alive, and interesting. The book reminds me a lot of another popular kids series, >Diary of a Wimpy Kid. Sofia as the narrator is funny, and the way the book is written, as if it is a diary or a journal, is always a good and different way to write something. All around the book is humorous, original, and a good kids' book. Review written by Samantha (6th grade student). We would like to thank Random House for providing a copy of GOSSIP FROM THE GIRLS' ROOM: A Blogtastic! Novel for this review. Have you read GOSSIP FROM THE GIRLS' ROOM: A Blogtastic! Novel? How would you rate it?